I felt like my kitchen needed some color, but I really didn't want to paint the whole thing. I am really liking having white on the walls. It makes the great room feel really open and bright. I decided that I could probably add some color if I put up some high trim. I like the idea of high trim because you can get away with using paint that is a darker shade. To create a straight line I used a drywall square and put dots around the room that were all 16'' from the ceiling. I connected the dots by turning the drywall square sideways and using it as a straight edge. 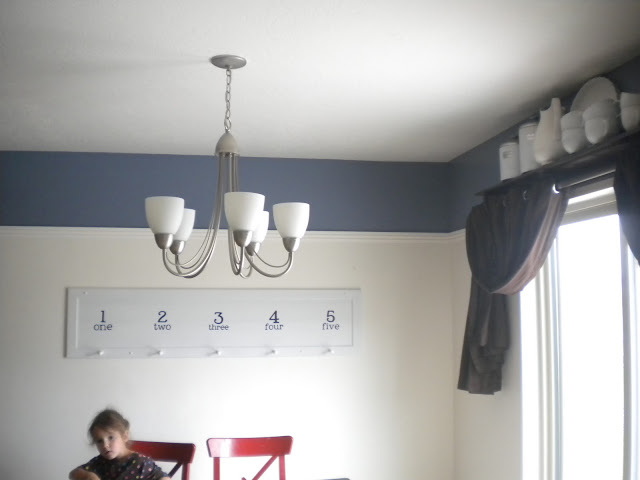 Even though all the dots were 16'' from the ceiling, I also tested the line with a level. Sometimes the ceiling isn't always straight. I bought casing for the trim and the total for the whole room was only $20. I cut the trim with a chop saw. For the corners and edges of the room, I cut at a 45 degree angle to make the pieces fit together nicely. I used a pneumatic nail gun to hang the trim. I love that thing! It makes hanging trim a snap! I went with a dark grayish blue paint. I started painting the wall before I put the trim up and I really did NOT like the color. It seemed way too dark. Once I got the trim up, I really loved it! Trim is so much fun!! I added some pics of the cabinets for you Torrie. Fantastic job. It really adds to the whole effect of the room. Love it. i am loving this but am confused on what is going on at the small wall where cabinets are or am i having a duh moment? Wow.. I never would have thought of that! Smart idea and it looks great! That looks so good. Great choice. I love it! Well done my friend. Oh I LOVE it! I especially love how the white plates and jars on the shelf above the window pop against the grey/blue. So purdy! Gorgeous! The blue with the dark cabinets and white is just perfect! You did a great job!